The latest Operating System from Windows, the Windows 7 has provided users with many new and extra features. 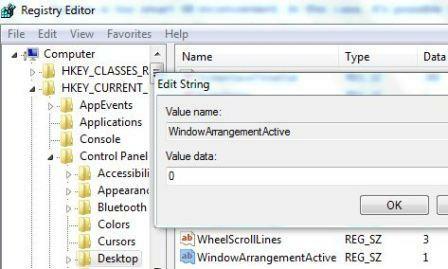 Smart Window Arrangement (SNAP) is one of the latest features added by Windows 7. It enables the user to rearrange or move the window easily. The main feature of SNAP is that the user can maximize the desired window by just moving it towards the screens top. The user can also expand and resize the window by dragging its edges to the position it wants to. The main motive behind designing SNAP is to arrange and manage the desktop’s window effectively. It is an extremely smart function that allows multiple windows being placed beside each other. The feature provides convenience for some and inconvenience for others. Users can easily disable or turn this feature off. To turn off or disable this feature please follow the steps provided below. Right click on the above mentioned key and select the Modify command. Set the REG_SEZ value of the Window Arrangement Active to 0. Reboot your system to experience the changes made. There is another way to disable SNAP. Download the registration file of the registry and merge its value directly. Then click on the downloaded file Disable-Windows-7-Snap.reg and prevent the window from getting snapped. Right click on the above mentioned key and select the Modify command. Set the REG_SEZ value of the Window Arrangement Active to 1. Reboot your system to experience the changes made and your desktop snapped. Just like the other way to disable SNAP, it can be enabled in another way too. Download the registration file of the registry and merge its value directly. Then click on the downloaded file Enable-Windows-7-Snap.reg and get your window getting snapped. In the “Small icons” or “Large Icons” view simply click on the icon of Ease of Access Centre. Click on the link “change how your mouse works”.